This flooring nailer gives you the flexibility to switch between the two most popular flooring fasteners without having to carry two separate tools. Designed to stand up to the rigors of everyday use, it is built with a hardened steel drive blade, rubber O-rings, and an aluminum body. The nailer features a light strike bumper, and comes with a lightweight fiberglass mallet. The white rubber head prevents marring when you move your flooring into place. On the rare occasion the nailer jams, the tool-free quick release makes it easy to get back to work quickly. The 360 degrees swivel Industrial NPT fitting gives you flexibility when moving around, and the air filter keeps the tools interior clean and running smoothly. Each nailer comes with a padded bag with front and interior pockets. This nailer can install most 5/8 in. to 3/4 in. solid tongue and groove flooring, and comes with interchangeable base plates. The no-mar base makes it safe to use on prefinished flooring. The 2-in-1 Nailer is designed to use 16-Gauge L-cleats from 1-1/2 in. to 2 in. long and also can use 15-1/2-Gauge 1/2 in. Crown Flooring Staples from 1-1/2 in. to 2 in. L. This flooring nailer is compatible with any brand staples or L-cleats. The 2-in-1 Flooring Nailer (Model: EFL50Q) is suitable for any professional or do-it-yourselfer. 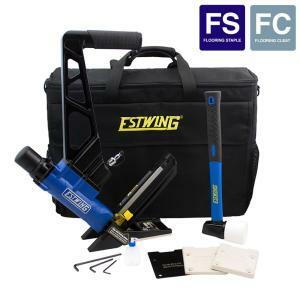 This flooring nailer is part of Estwings professional line of pneumatic tools, and is covered by a 5 Year Professional Tool Warranty and a 90 Day Wearable Parts Warranty. Tbook.com crawls the web to find the best prices and availability on Estwing and related Tools and Hardware products like Estwing Pneumatic 2-in-1 16-Gauge L Cleat or 15.5-Gauge Flooring Nailer/Stapler with Fiberglass Mallet and.... For this page, related items include products we find that match the following keywords: "Estwing" at our vendor partner Home Depot. Estwing Pneumatic 2-in-1 16-Gauge L Cleat or 15.5-Gauge Flooring Nailer/Stapler with Fiberglass Mallet and... is one of 156 Estwing and related products listed in the Tools and Hardware section of Tbook.com If you have any questions on this product, please give us a call at 734-971-1210 during the hours of 9am - 5pm EST for assistance. Thank you for shopping at Tbook.com, the Internet Department Store!